This morning I didn’t have my regular shift again because of the holiday week, so I biked to a new hospital for an herbal medicine shift instead. I didn’t know where we were going, so I was following another member of our group, or trying to. I was having a really hard time keeping up. At first I thought I was just really out of shape, but then I realized that my tire was flat… very flat. In the crazy traffic and crowded side streets I was pretty sure I would lose her and be lucky to find my way back to the hotel. She was kind enough to wait for me though and we finally made it safely to the hospital’s underground bike storage area. 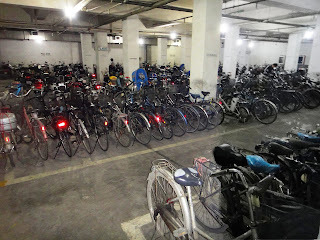 It is impressive how many bikes can fit in a parking garage compared to cars. If everyone drove in Nanjing, the city would be completely impossible to get around in. For all the flak China takes for being a dirty industrial place, Nanjing has the best infrastructure for bikes of any city I have experienced. I hope it will remain such a widely accepted mode of transportation. In Portland we talk a lot about being a bike friendly city, but in China they don’t talk about it, they just use it. A lot. It’s just more convenient and cost effective for them. Many people in China have an interesting attitude about the environment. There are recycling cans next to every trash can, but they hotel staff laughed at us for buying bikes when we had a car or private bus available to us. They think we have a weird fetish for “environmentalism”. The herbal shift turned out to be with a specialist in Pediatrics, Dr. Cai. The first thing you notice about Dr. Cai is his awesome white hat, and the second is his big grin. He has a kindly manner that makes him perfect for dealing with little kids. The room was packed most of the time, with kids, parents, other hospital staff and us observers. Because this was an herbal shift, it mostly consisted of writing down the children’s complaints and the doctor’s formula. Dr. Cai was very kind about answering questions, but the number of patients made us hesitant to ask many. In the herbal clinics in China there are no scheduled appointments, you just show up, get a number and wait in the room or the hall until it is your turn. Privacy is not really a concern for most patients. Half the time if we asked to see a child’s tongue, parents of the other patients who were waiting in the room would lean in there to have a look as well. It was cramped and crazy-making. 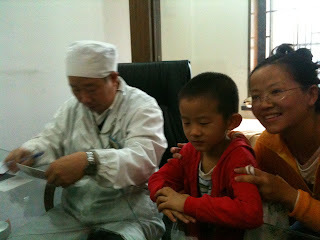 Dr Cai had a good rapport with the kids though, who were remarkably quiet and well behaved in most cases. He explained that all children under three have Qi and Blood deficiency, so it is not useful to feel the pulse the way we do for adults. He confirmed that using the vein on the index finger was more useful, as we had already learned in the pediatrics class at OCOM. He explained that he mostly uses his eyes, percussion and auscultation (listening with a stethoscope) to diagnose children. For example, if the coating of the tongue is geographic, i.e. peeled in places, it is the manifestation of an allergic constitution in 50% of children. Asthma was the most common condition children were coming in for. Asthma is particularly interesting in Chinese medicine because we look at the causes and manifestations differently. For example, when we think of asthma in the west we think of the bronchi, or tubes that open into the lungs. However, in many cases of asthma there are also nasal symptoms and skin problems like eczema. These may all have a similar cause according to TCM (Traditional Chinese Medicine) and thus one treatment can target all of them. Dr. Cai also emphasized doing a correct differentiation for the cause of the symptoms. For example, in one case a child’s cough was caused by post nasal drip, so just treating him for cough would have done little good. In addition to herbs, the good doctor showed the parents specific pediatric tuina massage techniques to do for their children. For cough, he told them to massage down the Du Mai (on the spine) with a warm edge of their hand or use gua sha (a technique of scraping the skin). Most kids like this kind of massage, and it is surprisingly effective. For itching in the throat, he had parents massage points on the sternum, like Tian Tu or Shan Zhong and asked the kids to drink warm water. These things are fairly simple, but the beauty of working with kids is that they are very sensitive, so you don’t need to use really strong therapies like needling most of the time. 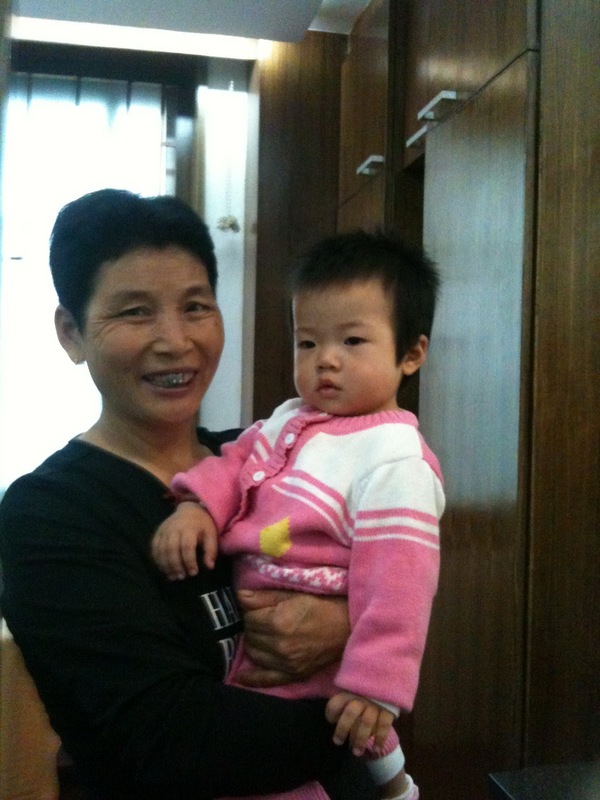 That being said, there was a four year old that Dr. Cai put on an IV medication for a few days to control her asthma. He explained that once you have a flare up in childhood asthma can become more severe. atient’s condition would have either improved on its own or deteriorated to the point that it would be much harder to treat. In some ways we really do have a backwards healthcare system compared to China. I hope we can keep pushing the healthcare envelope, because I believe we can do better for patients in the US. On the other hand, I can’t agree with all of the medical practices in China. For example, antibiotics are more widely used. In some cases doctors use both antibiotics and herbs based on the theory “If one doesn’t work, two will”. I will not say that antibiotics are never appropriate, but with growing concerns about antibiotic resistant superbugs, I believe they should be used as sparingly as possible. The other problem with antibiotics from a health perspective is that they wipe out the helpful bacteria in the gut. Your gut becomes like an abandoned building in New York city – you know some shady characters (bad bacteria) are going to move in if you leave it empty. Chronic gastritis (stomach inflammation and pain) seems to be a surprisingly common complaint in China and I wonder if the overuse of antibiotics plays a role. Despite the antibiotics thing, Dr. Cai did have some good advice for a seven year old with poor appetite due to constipation since he was one year old. He showed the parents how to massage downward on the abdomen with flat palms 200 times every day to help him form the habit of having a bowel movement daily. He also said that the boy was eating too much protein and seafood and not enough vegetables. He particularly recommended that he eat pumpkin, since it has a lot of natural fiber. After the morning shift I had to walk my bike back the hotel or ride it and risk my rims. I rode partway but wasn’t particularly happy about it. There is a guy who repairs bikes right next to the hotel, so he patched up my tire for 4 yuan. I have to say it was impressive to watch. He had just a few tools and a bike pump on the side of the alley by the hotel, but he definitely knew what he was about. In the afternoon we had a lecture at the university on two different herbal formulas for treating women. It was given by Dr. Huang Huang, who is apparently quite an expert in gynecology. His lecture was amusing as well as informative. He spoke in Chinese through a translator, who he teased that a certain formula (Qin Jie Lian Qiao Tang) was appropriate for her. He stated that this formula is good for women who have inner heat or fire, with red, red lips, and a glorious oily face. He said that these women are pretty but uncomfortable. She blushed a little, but I admired her poise in translating it. The other formula he discussed was Wen Jing Tang, which is often prescribed to older ladies, who have lower estrogen. He said that it may reverse precancerous changes, give beauty and longevity, treat dry skin and lips and make the nails beautiful. Skin moisture relates to the estrogen level in the body and this formula lacks the side effects that taking estrogen causes. He also said that for healthy skin we should encourage patients to eat pig or chicken feet, as they are full of collagen. I have to admit that while I ate chicken feet after that, I’m not sure I would have much luck convincing my patients in the US to do that. After the lecture I wandered through a back street behind the hotel with Jon, a friend from OCOM. This was basically an alley that cars would not even fit down. Tiny shops enclosed on three sides sold everything from DVD’s to shoes to foot massages. At one of the foot massage places Jon managed to accidentally tell the woman there that he was Canadian, because she was speaking to him in Chinese and he was answering in English. Jonathan sounds like “Jianadaren” or “Canadian”. It was a fun little game of telephone we played when I returned. Some of the folks there that could say just a few words of English (mostly hello, bye bye, pretty and good) were pretty aggressive about wanting to talk to us foreigners. We saw a park where retired people were socializing and using the exercise equipment. 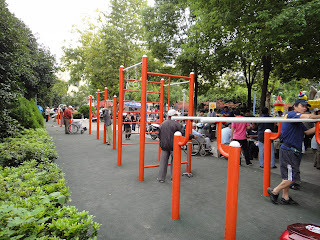 Yup, many parks have free exercise equipment in China, and they are often packed. Other folks were playing Mahjong or cards. There wasn’t too much in the way of green space, but you definitely get the impression that everyone feels safe in the parks and community life thrives there. Some parks also have instructions on how to do exercises for frozen shoulder etc on the equipment. 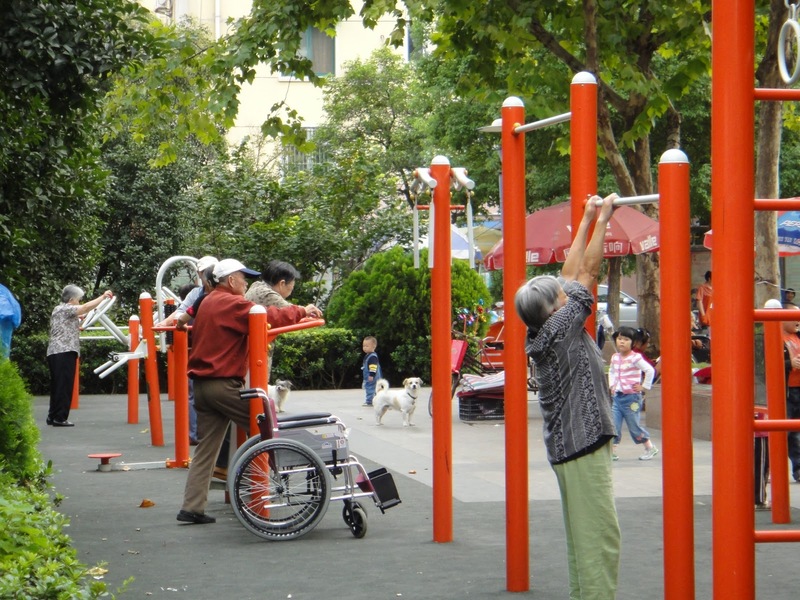 It’s not geared at heavy weight training, but signs say things like “this exercise helps you stay strong enough to pick up your grandchildren or the groceries”. It’s all free of course, and I wish my patients all had access to places like that in their neighborhoods. I could tell them to Parkercize! It’s the perfect way to help people stick to a daily exercise routine because it is so social. was able to give us the fabulous deal listed on the cards he was passing around since we were foreigners and students. The deal was kind of a deal, with free sangria and European fusion style entrees that were not more overpriced than they would have been anywhere else in China. The atmosphere was almost creepy but instead it was hilarious. The seats were hybrids between a bench and a couch, coated in a plush green or purple fabric. There were alcoves with curtains and an empty band stand. The Chinese diners were all kind of seated in back corners, while we were escorted to the big table in the middle of the place. I got the impression that he was trying to use the pictures he has taken of all the foreign guests to create the impression that the place had a cool vibe too it, because there was a slide show of them eating and dancing or listening to live bands on the wall. At the end of the meal the owner took a picture of all of us and invited us to stay for karaoke or come to poker on Tuesday nights. I have the feeling that we are now also up on the wall. Restaurant review: to make a long story short: the food was decent but nothing special and the creepy manager was trying way too hard.